Please feel free to go to our website to BOOK ONLINE, or email us to request a reservation. Website, and email displayed on the right. 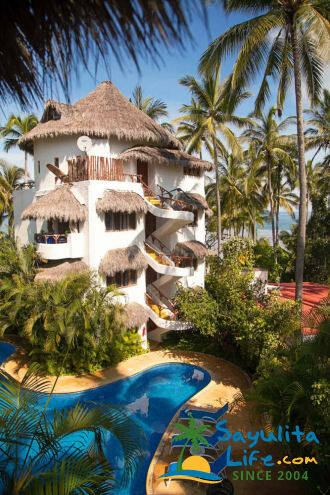 This is one of the Sayulita's most beautiful beachfront vacation rental locations. Casablanca Beach Froont Hotel, located in the North of Sayulita offers everything the Sayulita vacationer needs. Choosing from the beautiful MAIN HOUSE or any of the 14 charming SUITES, you vacation needs are met. The BEACH HOUSE of Casablanca is located directly on the Sayulita beach offering non-stop views of the beautiful Pacific Ocean and Sayulita's famous surf break. The design of the BEACH HOUSE offers privacy with harmony. It has 3 master suites, each with 1 king size bed, full bath and terrace. There are also 2 bunk single size beds allowing for up to 10 people to sleep comfortably. 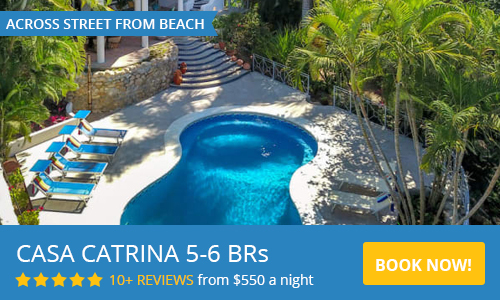 You will enjoy a large heated pool right at the beach edge and a huge outdoor palapa to enjoy Sayulita sunsets that has dining and living area with BBQ grill. There is fully equipped kitchen and large family room with Satellite TV and VCR indoors. The MAIN HOUSE and all of its facilities are completely private from the Casablanca Suites. Casablanca also offers 14 SUITES behind the BEACH HOUSE. The beautiful SUITES offer all of the amenities you will want for your Sayulita vacation, a small living area with a sofa, a private terrace to enjoy the ocean view, a kitchenette and Satellite TV. There are 3 types of SUITES, Suite A offers 1 king size bed, Suite B offers 1 bedroom with 2 full size beds, and suite C offers 2 bedrooms, one with 1 King size bed and the other with 2 single bunk size beds. A & B SUITES can be joined indoors. A large swimming pool is located between the SUITES for all guests to enjoy. In addition there is a large palapa near the pool for gathering at sunset, or shade during the day. 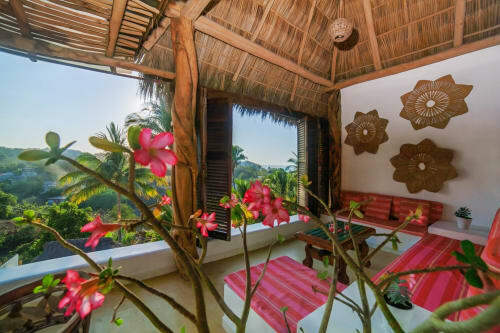 There is also a palapa on the third floor offering a beautiful view of Sayulita's beach and surf break. While on the third floor palapa, be sure to enjoy the Jacuzzi and BBQ grill. Casablanca Beachfront Hotel is committed to catering to all of your needs. Whether you are vacationing privately, or with a large group you will love your stay at Casablanca Beachfront Hotel in Sayulita, Mexico. Warnings should be given about Sayulita sickness. The hotel is lovely, however, it is reasonable to expect the hotel to let visitors know how dire the sanitation issue is in Sayulita. Since January all of the raw sewage in Sayulita has been flowing into the ocean in the middle of town. This is why so many people are sick. Not because of tequila, or sun, or spicy food. I'm not buying that. it is on the business owners to warn people, and help them make educated decisions about bringing their family. Had we known how bad it is, we would have never come. We walked through the door and WOW. The condo was beautiful and the view, breathtaking. The maintenance staff went over and above. Very helpful with our luggage. Even when our cart battery died the maintenance staff was there to assist to get us back up the hill. Just overall wonderful. Chelsea was extremely helpful during the entire process. Would definitely go back. My husband and I just stayed at Casa Blanca while in town for my friends wedding. The location is perfect....a little ways from the main beach strip. They have private beach chairs and umbrellas. We stayed in a “A” suite and it was perfect size and very clean. The only negative would be that our room and the little porches had no view at all, next tine we will ask about that before we arrive. The staff was friendly and accommodating. This was our second time staying at CasaBlanca. During our prior stay we rented one of the "B" suites (2 queen beds) and this time we were in an "A" suite (one king bed). Our A suite room had 2 balconies however the balcony off of the main living room overlooked the hotel parking lot and the one off the bedroom overlooked the maintenance area of the house next door. Not the best views. We were able to use the balcony off of the bedroom for meals as that had a bit more privacy. The rooms are nicely decorated and very clean. We used the kitchen for breakfast and lunch every day. It is well stocked with all of the things you would need for simple meals. The best part of the hotel is the proximity to the beach. Just a short walk. There are 4 umbrellas with 2 lounge chairs each. We never had a problem getting a chair or shade. The pool area is also quite nice and provides more shade. Overall, I would recommend CasaBlanca and hope to be back soon! This place was perfect! On the quiet end of the beach yet close enough to walk to dinner! Everything you need! Highly recommend and would definitely stay here again! We truly enjoyed our stay at Casablanca. Our suite had everything we needed. The air conditioned bedroom was super comfortable. You could hear waves crashing from both rooms. They offered plenty of drinking water and ice. The pool and grounds were beautifully kept. The only downside was the construction noise taking place next door. It would begin early morning and go most of the day. 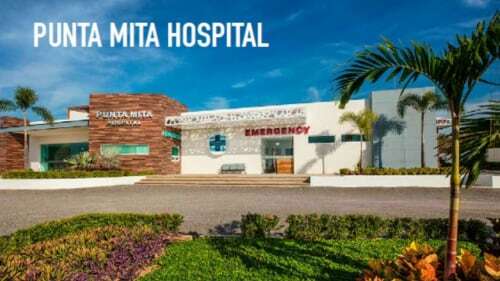 We look forward to visiting again, hopefully when the project next door is complete. How to slow down and enjoy. I had such a relaxing and rewarding stay from the staff that was fanatic to the room that was spotless. The grounds were so pretty with the different plants with yellow flowers to red ones. The sunset on 6-11-18 was the just as pretty as any i have seen. The pool was a great place to spending time and melting the stress away. 1. My husband and I stayed at the hotel a night before guests started to arrive and we were robbed. In the middle of the night, someone came into our bedroom (which was definitely locked) and took my purse, a very expensive camera and few small electronic items. I actually woke up as the person was leaving our room and my husband jumped up when I woke him and we ran outside and looked around the front desk area and tried to alert the night guard-- we did not see anyone around. The good news was they found my purse on the grounds and the only thing missing was cash. The hotel responded appropriately and made a police report, but my issue is the lack of security in this room. The handle was wobbly and the type of lock can be opened with a credit card--as we were shown later the next day. This is shocking to me that they didn't have a way to lock the door from the inside, but the hotel did add a lock at my request. With close access to the beach, on the sleepy part of town, just be extra careful especially if you're on a ground floor room and don't count on night security to be around to help out. 2. The hotel painted one of the rooms the day before a guest was going to arrive and shut all the windows. When the receptionist let them in, even she was taken back by how intense the paint smell was. It was clearly not inhabitable that night and the toxic smell even made our guest sick. The next day wasn't much better and the smell was still very strong. I asked the hotel to refund the guests 2 nights because they didn't/couldn't sleep in there and the hotel refused and actually said we were over exaggerating. I was not impressed at the way the hotel handled this situation, which left our guests out $300 and having to bunk up with other people on their couches--not an ideal vacation situation. I think the direct hotel staff were lovely and this has potential to be a great hotel, but the manager level customer service and hotel security was lacking. Even though the hotel and rooms are beautiful I won't be staying here again. Stuff is friendly and always able to help they make you feel at home. Specially thanks to Chuy for his hospitality and service. Clean and safe. We had a two bed suite which we loved. This is our second year and we will be back. Staff is wonderful. Walking distance to town. Quiet. Beach close by. Wonderful pool. And, this year we discovered the hot tub. We could sit back and view the stars. Any concerns were immediately addressed. We are a small Sayulita hotel, with perfect location: right in front of the beach, and only 10 minute walk to town's plaza; in beautiful north end of Sayulita. Where its quiet and relaxed... Far away enough of the town's noise, and close enough to walk even at night. Best way of booking, directly trough our main WebSite: CasablancaSayulitaWe have only 14 villas and a private main house located right in front of the beach.Right next to the turtle release in Sayulita, great service and comfort for your vacations.​We wish you the the best experience in "our" Sayulita town, always!Thank you! !